First Solo Sailing Circumnavigator Tells His Incredible Story. Sailing Alone Around the World is a firsthand autobiographical story of Joshua Slocum, the first man to sail singlehandedly around the world. The book, first published in 1901, would be considered an “old book” if not for the fact that, by any other measure, it is a timeless story. Slocum’s personal words, illustrations, and maps combine to create a literary gem that serves as a memoir of adventure travel, a motivational and spiritual guide, and a lesson in modesty and resilience. Sailing Alone Around the World is the story of an aging sea captain who, in 1893, found himself out of work, out of prospects, out of plans, and out of dreams, but somehow managed to put himself back to work, create his own prospect, make a daring plan, and pursue a new dream. In doing so, Slocum not only succeeded in realizing his seemingly impossible dream, but also succeeded in turning himself into a record-setting global hero, whose voyage was followed closely by newspapers in every country in the world. His is a timeless story of courage, of defying the odds and the naysayers, and of changing the world of sailing—and of dreaming—forever. Before 1895, Joshua Slocum was a professional ship captain in an era of transition from sailing ships to steam ships. Like many commercial captains of that generation, he took his family along on the ships he captained while delivering cargo from port to port in different parts of the world. Rather than be away from his family for months or years at the time, his wife and children traveled with him. But in an era that life expectancy hovered somewhere in the mid-forties, Slocum at fifty found himself unemployed and without prospects of future employment. An acquaintance gifted him the decrepit remains of a small boat called the Spray. It was a 37-foot oyster sloop, whose wood had rotten away and left little of its original structure and none of its seaworthiness. Slocum, an endlessly curios self-educated maritime expert had a good working knowledge of shipbuilding, which he applied to restoring the Spray, bringing it back to its proud, seagoing past. The boat was designed for coastal work, not for ocean crossing, but that did not stop Slocum. After he sailed the Spray locally up and down the New England coast, a publisher suggested a journey around the world—alone! No one has ever done that, let along in a small sailboat, but Slocum was undeterred. Sailing Alone Around the World chronicles Slocum’s three-year journey, beginning in 1895. He crossed the Atlantic to Gibraltar, then back west to South America, struggled valiantly through the traitorous Strait of Magellan, and sailed across the Pacific. He paid visits to various islands, visited New Zealand, Australia and South Africa, and then crossed the Atlantic for the third time, arriving back in Massachusetts with his sailing log at over 46,000 miles. Slocum writes in a conversational, unassuming voice of a man who knows what he is doing and faces the elements with even temper and a cool mind. His descriptions and illustrations of fascinating foreign lands, many of them unexplored at that time, as well as sea and land animals, are priceless. The challenges that nature threw in his way across the vast oceans nearly destroyed him and the Spray many times. He faced pirates, savages, thieves, and a variety of mechanical and technical breakdowns, each potentially fatal. Defying all odds, he returned home to write the book while becoming a household name and serving as a role model for countless courageous sailors who risk their lives circumnavigating the globe even today. The book’s fluid prose is clear and straightforward so that even the modern reader quickly forgets how long ago it was written. Between the lines, we can tell that Slocum was a humorous man, who took life seriously, but didn’t take himself too seriously. He risked his life repeatedly in a pursuit of a dream, but he writes about it with no pretentions. On the contrary, he makes it sound as if anyone could have done it. An amusing anecdote tells of Slocum’s meeting with the popular, long-time president of the South African Republic, Paul Kruger, a man of German descent who was deeply religious. When Slocum was introduced to President Kruger as someone who was sailing around the world, the president became upset and insisted that Slocum was selling on the world, not around it. There followed a meeting with the president’s team of scientists who were busy proving (at the president’s insistance) that the world was indeed flat and not round as most of people knew. With his typical humor, which got him through other tight spots throughout his long journey, Slocum made light of the disagreement and agrees to consider the world flat while he was on land. Thus earning President Kroger’s affection, Slocum enjoyed extensive sightseeing trips across the magnificent South African topographical wonders, vibrant wildlife, and fascinating tribal cultures. Even when describing horrendous conditions and near-death experiences at sea, the author tells his story matter-of-factly, explaining how he contended with each crisis in a practical and logical way. When he describes how he fell off his boat during a violent storm while trying to change sails, he mentions casually the fact that he had never learned how to swim. “What is the point?” He asks. In other words, it was the opinion of this lifelong seaman that, when a person falls off in the middle of the ocean, he is better off drowning quickly than treading water for long time only to suffer a slow death. Considering that his trip took place before radio or any of the modern communication devices that and can alert rescuers the distress, his logic appears sound, though extreme. 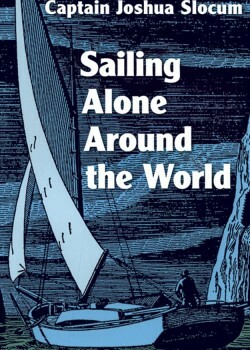 In summary, Sailing Alone Around the World is a fascinating story, well written, and suspenseful. It provides a snapshot of an old world, barely on the verge of modernity, yet it creates a panoramic snapshot that provides unique perspective and a spectrum of details without comparison. For those who love sailing, or any kind of extreme adventure, this book is obviously a must. Yet its appeal would be strong for anyone who appreciates human stories of overcoming incredible odds and setting a new path for others to follow. Reading Slocum’s Sailing Alone Around the World is as close as it gets to the literary equivalent of taking a journey around the world.